I posted on here recently the news item that the Marsh Christian Trust had given an award to the Wooden Canal Boat Society’s Chris Leah, and I featured one of the photographs I had taken of Chris on the canal. Here is another shot taken when I spent time with the Society. 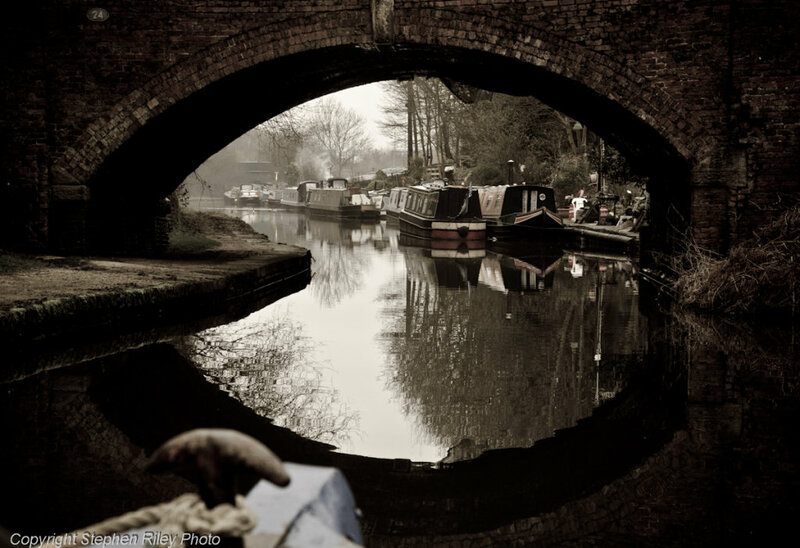 Taking to the water and viewing Tameside’s towns from its canals delivers a very different visual take on the place. You can be just yards from a road you drive down every day, but viewing it from the canal throws up an entirely different aspect and experience. This shot is a case in point. In truth, because the view is so different, I am not quite sure if this is in Guide Bridge, Audenshaw or if we had slipped into Droylsden; it is on the Ashton Canal, which links these places. But, whatever the case, what this image does tell us is that there is a beautiful other world, even in the midst of our damaged and disused industrial areas, if we take a moment to follow a different path.